The Olympian 12 foot fronted premium metal garage is an apex roof garage manufactured from, hot-dipped galvanised steel throughout, finished with powder coated paint to provide a long-lasting, maintenance free lifespan. 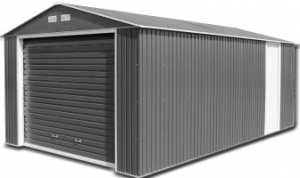 This garage provides ideal storage for your car, whilst allowing extra room for a variety of storage requirements. 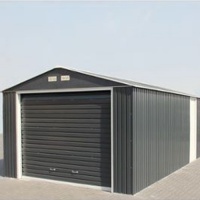 This building is perfect for all sites where non-combustible storage is compulsory and will provide a rust-free, durable storage solution for a minimum warranty period of 10 years. 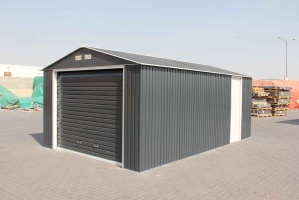 EMERALD Garages are high specification light clad metal buildings. Apart from the high grade of steel and paint finish, they have ventilated gables, a robust heavy metal framework, a roll-up & over main door, a personal access door and a tall wall height, allowing you to park tall family cars into the garage, unlike other premium garages. 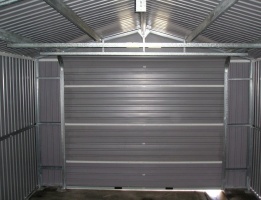 Each Emerald garage has large opening doors, which are fully lockable. These doors, provide great access to all your stored items through the spacious opening.